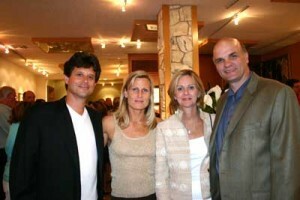 Gallery owners Josh and Kim Miller pose with St. Joes Head Coach Phil Martelli and his wife Judy during the exhibition of original lithographs, etchings, and linocuts by Rembrandt van Rijn, Pablo Picasso, and Marc Chagall. 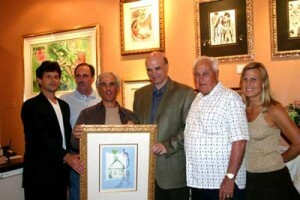 Master artists weren’t the only ones garnering attention at Ocean Galleries over Memorial Day Weekend. Renowned college basketball coaches tried to steal the spotlight away from Chagall, Rembrandt, and Picasso for a worthy cause. Along with the Masters, Ocean Galleries hosted a charity auction that benefited the non-profit organization Coaches vs. Cancer. Phil Martelli, head coach of the St. Joseph’s University Hawks men’s basketball team, served as auctioneer. Joining Martelli were Fran Dunphy, head coach of the University of Pennsylvania Quakers and Jack Kraft, former coach of the Villanova Wildcats. The exquisite item up for bid was an original color lithograph by Marc Chagall titled “The House in My Village,” which was generously donated by Ocean Galleries. The winning bidder was Cape May County resident Andy Moceri. Coach Martelli, who guided the 2003-2004 Hawks to an undefeated record – the school’s first-ever number one seed in the NCAA tournament and advancement to the Elite Eight, has been involved with Coaches vs. Cancer for several years. The program unites the American Cancer Society (ACS) and the National Association of Basketball Coaches (NABC) in the fight against cancer. Since its inception in 1993, Coaches vs. Cancer has raised more than $22 million to benefit ACS’s efforts in cancer research, advocacy, education and patient services. 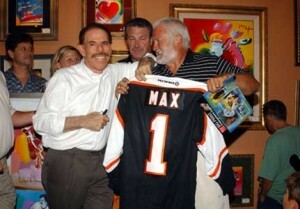 Peter Max poses with former Philadelphia Flyer Bernie Parent during the Building a Better World exhibition on Fourth of July Weekend. Philadelphia Flyers 1974-75 Stanley Cup Team members Bob Kelly, Dave Schultz, Bernie Parent and Rick MacLeish were on hand for the unveiling of the commemorative painting celebrating the 30th anniversary of the win. 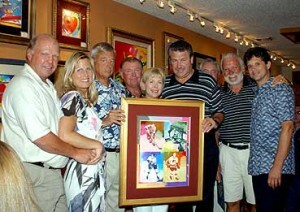 Al and Suzzane Lord of Annapolis, MD, had the winning bid for the Peter Max commemorative Philadelphia Flyers 1974-75 Stanley Cup painting which was auctioned off at the Ocean Galleries’ Stone Harbor location on Friday, July 2. From left to right are: Flyers Ambassador to Hockey Bob Kelly, Ocean Galleries co-owner Kim Miller, high bidder Joe Lord, auctioneer Steve Coates, Suzzane Lord, Dave Schultz, Rick MacLeish, Bernie Parent and Ocean Galleries co-owner Josh Miller. After traveling extensively for two years in search of the beauty and light which infuses his paintings, Howard Behrens unveiled his Mediterranean Holiday exhibition at Ocean Galleries. 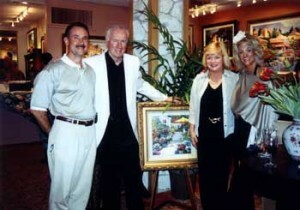 He is seen here posing with his wife Judy and a pair of art collectors. 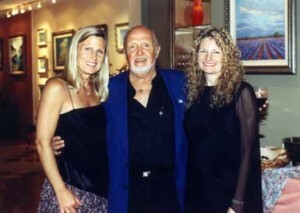 Joanny (center) and Joan White-Spunner (right) showcased their unique landscape painting styles during this dual exhibition. 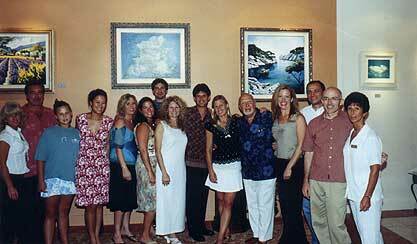 Here they pose for a quick photograph with gallery owner Kim Miller, and below in a group shot with the gallery staff.